COMMENTARY — Please allow me to explain what is about to happen for the remainder of this column. In response to Scott’s endless tirade of cheap shots at the Utes, I came up with a bet: If BYU ended the season with a better record than Utah, then Scott could write a paragraph I had to include in my column, and I would get to write a paragraph for Scott’s column if the Utes ended the season with the better record. As I am sure everybody is well aware, BYU ended the regular season with an 8-4 record, while Utah only had a 5-7 record. Accordingly, this column is the chance for Scott to claim his payoff. The problem is that Scott has bailed out on me. Two weeks ago on Monday (Nov. 18), Scott emailed me, anxious to cash in on the bet by submitting a paragraph for my column the following Monday. After exchanging additional emails, it turned out Scott was out of town, so the payoff was postponed a week to this week. The last email I received from Scott a week ago was in favor of him having a paragraph for my column this week, but ever since, it has been nothing but crickets from his side of the email, notwithstanding multiple reminders from me requesting his paragraph to insert in my column. Perhaps when Scott actually gave some thought as to what he might say, and anticipated my obvious comeback, he realized he was in a no-win situation. Be that as it may, I always honor my bets. Accordingly, in addition to the quotes from Scott’s earlier column above, the following are some direct quotes from his emails to me as his contribution to my column as the winner of our bet. While it is tempting to let emotion overcome my common sense, I will follow the lead of Detective Joe Friday from Dragnet, and just stick to the facts. Before I go any further, I will freely admit that BYU is a good team that has seen some success this year. Nothing I say from this point forward will turn any of the Cougars’ wins into losses, or change the fact that BYU is going to a bowl game and Utah is not. Having said that, let’s have some fun and take a closer look at each of the seasons just completed by the U and the Y. This is going to be easier than shooting fish in a barrel. Let’s start off with common opponents. There is only one — both Utah and BYU played and beat Utah State. Although the Utes beat the Aggies with Chuckie Keeton, whereas the Cougars did not, I’ll still call it a push because I don’t need this match-up to make my point. Next, strength of schedule. According to Jeff Sagarin’s College Football Ratings (available at www.sagarin.com) as of the results through Saturday, Nov. 30, Utah ranked No. 1 for the toughest schedule played in the nation. In contrast, BYU played the 32nd toughest schedule this season. Advantage Utah. The overall winning percentage of all of the Utes’ opponents was .614, whereas the Cougars’ opponents collectively only managed a .545 winning percentage. Advantage Utah. Notably, the teams that beat Utah had a .671 winning percentage, while teams that beat BYU had exactly a .500 winning percentage. Advantage Utah. The Utes only played two teams with losing records, and beat them both. The Cougars played four teams with losing records, and split those contests 2-2 (including a loss to 2-10 Virginia). Advantage Utah. Quality wins are very telling for both teams. BYU’s marquee win was a home victory over Texas (currently No. 25 in the BCS rankings). Utah’s signature win was a home game against Stanford (currently No. 7 in the BCS rankings). Advantage Utah. So what was the second-best win for both schools? BYU beat 8-4 Houston, and Utah beat 8-4 BYU. Okay Scott (and the rest of Cougar Nation), you tell me — which win is something to be more proud of, beating the Houston Cougars or beating the BYU Cougars? The reality is that competition in the Pac-12 is good, very good, and much better than anything the Utes (or the Cougars) have consistently faced in the past. On the other hand, BYU’s schedule was far less competitive than the schedule played by Utah. The bottom line is that if the Utes and the Cougars had played each other’s schedules, then Utah would be going bowling with a winning record and BYU would be sitting at home over the holidays. Admittedly, even I have referred to Utah as the George Costanza of the Pac-12. However, George is the lovable sidekick of Jerry Seinfeld on an iconic show that will go down as one of the best sit-coms in history. I’ll take it. In contrast, BYU has a starring role on public access cable TV. Even Wayne and Garth did not hesitate to take Wayne’s World to network TV the second an opportunity presented itself. Will such an opportunity ever be afforded to BYU? Nobody is more disappointed than I am that the Utes will not be given another shot at the Cougars until 2016. Beating BYU has become an annual highlight for Utah as it transitions into the rigors of being a part of a very competitive Pac-12 Conference. I am very curious to see the direction these programs head over the next five years. Will playing in the Pac-12 allow the Utes to recruit more talent? Can the Cougars keep attracting talent and play at a high level with only a handful of quality teams and a lot of low caliber teams on the schedule? I guess we’ll just have to wait and see. So Scott, what do you say, same bet next year? 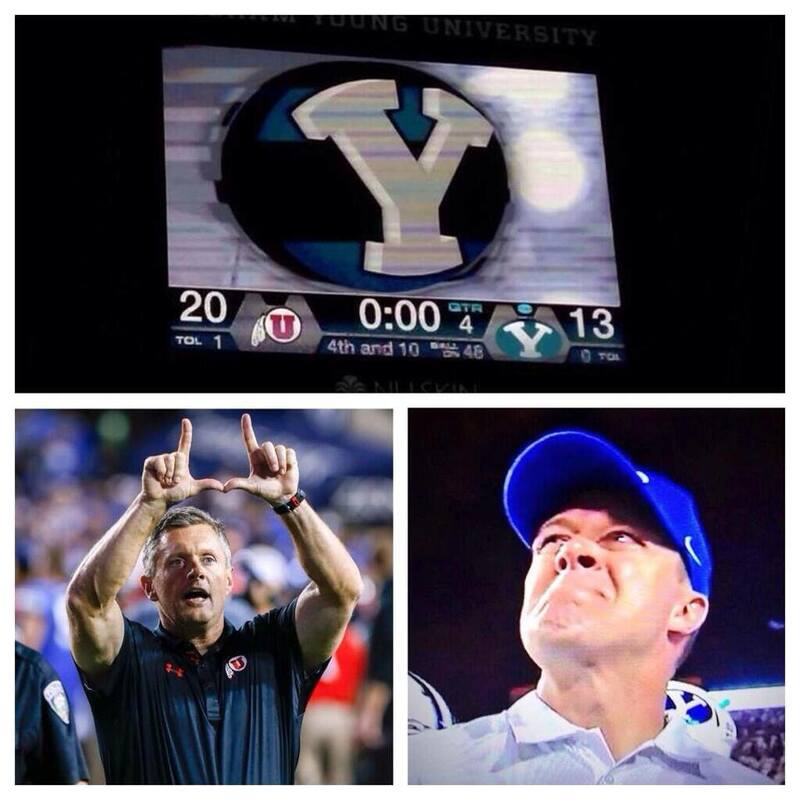 Two losing seasons in a row for Utah…another winning season for BYU. Advantage BYU. Another season of Utah sitting at home during the holidays…BYU going to another bowl game. Advantage BYU. I can see BYU games on tv EVERY GAME.. Utah, nowhere to be seen. Advantage BYU. Utah finished in the basement of the PAC-12 again… yet, all I’ve heard from Ute fans is that they will be smelling Roses and competing for the PAC South Crown. Scott’s reference to Utah being the Wyoming of the PAC-12 was spot on. Keep on throwing those parades for your PAC-12 membership, but please realize that Utah is the PAC welcome/doormat of the PAC. Enjoy another bowl-less season at Utah, Dwayne… it looks to become the norm for the mighty Utah PAC-12ers.